Image Title: . :: 2007-002 ::. Excellent macro Roberto. Congrats for the BIP. Very sharp focus and great dof, lovely colours (quite different from what we see here), I like the tack sharp eye with the catch light. Very well composed. Very well done. Hi heshan. My fist exhibition is about isects macro shots. what's about your first exhibition?. Parabéns, Roberto! O detalhe está FENOMENAL!!! Great colour and detail Roberto. Congrats on the BIP! A prosperous 2007 to you and your loved ones. Take care! It doesn't get any closer than THIS !!!!!!!!.... AWESOME, dear Roberto !!!!! Powerful and impressive macro portrait my friend, very well deserved bip, congrats!! You did a great shot again..
Wow, stunning macro, Roberto. Congrats on your BIP. Cheers, Ann. I have been showing your photographs to all of my friends and they all love it. You are so talended and have a great eye for details. A superb macro, Roberto, and congrats on the very well deserved BIP! Otro macro espectacular... felicitaciones , colores y texturas sorprendentes! It stands out very nice on that background. Keep them coming and congratulations for the BIP. man i was the first to comment on your photo and i knew u will win somthing . congrats on the Best In Project you desurve it . Fabulous macrowork Roberto, the colours on the insect are fan-tas-tic !! Congrats with the BIP award !! Roberto & Gennaro two BIP. wow!!!!! excellent macro shot dear Roberto!!! congratulations for the well deserved BIP!!!!!!! 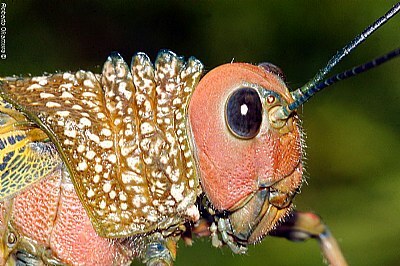 Beautiful macro of the grasshopper. Perfect in every detail!! !Great sharpness. Hi Omar! Thanks for visiting my images! Here in Brazil we have a lot of kinds insects and animmals. I live in a region that is a transition for 3 ecosystems like Pantanal Matogrossense (flooded area rich in wildlife), Amazon rain florest and Cerrado (Brazilian savana). Ig gardem is little difficult to see theses insects, I usualy go to wild places to catch it. Very nice work! Great sharpness, wonderful insect anyway. Isso que podemos chamar de uma macro perfeita!!!! Very impressive! Beautiful colors here. man i went through all your Pictures , amazing job . but my question is where do you find those Amazing Insects and creatures . i got my 105mm nikkor and never found a good looking insect to take a pic of . is it that u go to some kind of insect garden or u find it in the nature ! amazing pics man keep up the good work . love the colors too, this could be a good add for sigma 105 .